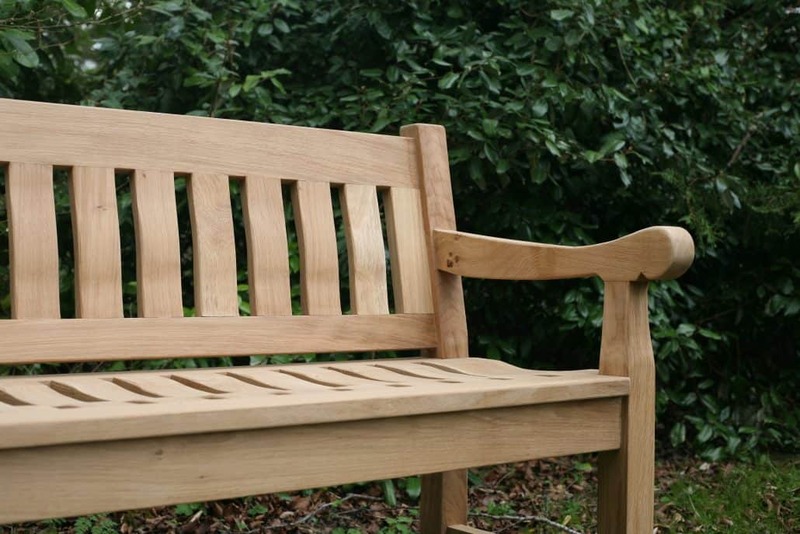 For Steve, the most important person when he’s making a piece of bespoke furniture, is you, his customer. Commissioning any piece of furniture is a very personal experience and Steve is always focused on wanting to make sure that you are as thrilled with the end result as he is. That is why Steve was delighted to be commissioned by John Lewis & Partners and the Leckford Estate to furnish their Longstock Farm Shop Café, as they share this same ethos in everything they do. John Lewis & Partners is known for going above and beyond to offer quality products and outstanding service to the people that matter most – their customers. Because as they say, ‘for us it’s personal’. Leckford Estate in Hampshire is the Waitrose Farm and their produce is supplied to Waitrose stores across the country. 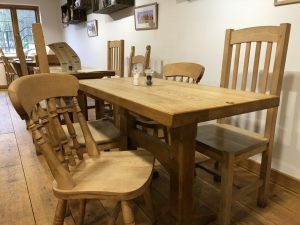 Opened in 2013, the Longstock Farm Shop Cafe is an integral part of the Farm. Here you can enjoy a rural but vibrant view of the water garden and plant nursery. It is a popular destination for fresh locally sourced food, including produce straight from the estate farm. 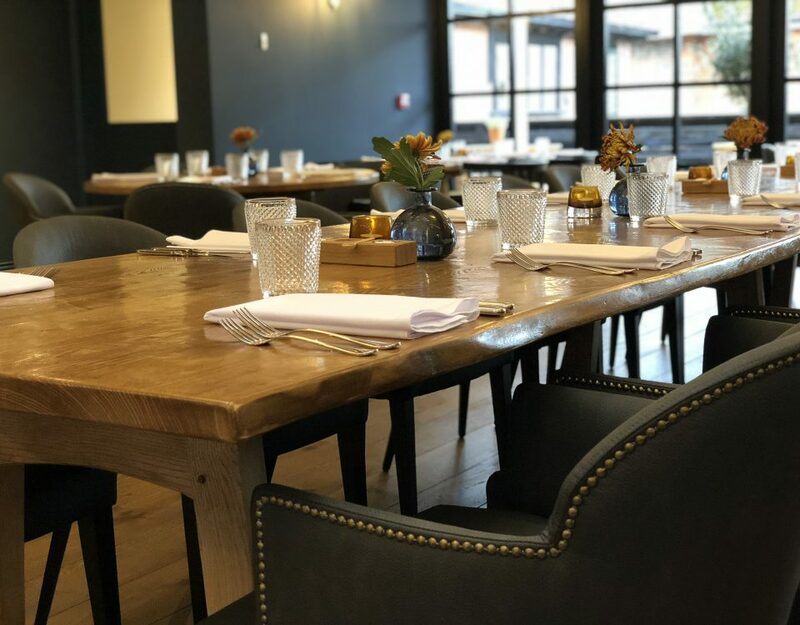 A perfect place not only to stop off and enjoy refreshments, with handmade, home-cooked dishes but also to experience more of Steve’s craftsmanship. 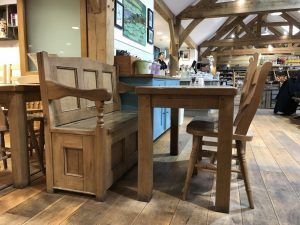 Steven Baker Furniture has made and supplied all the tables and seating furnishing the Farm Shop Café, adding to the stylish welcoming space with its oak beams. 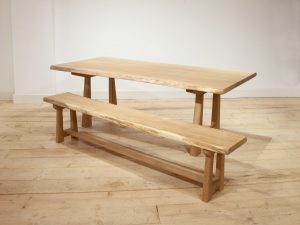 There’s a good choice of larger style trestle tables for family style dining, as well as smaller sized tables for small groups and couples. Along with a playful mix of seating styles. 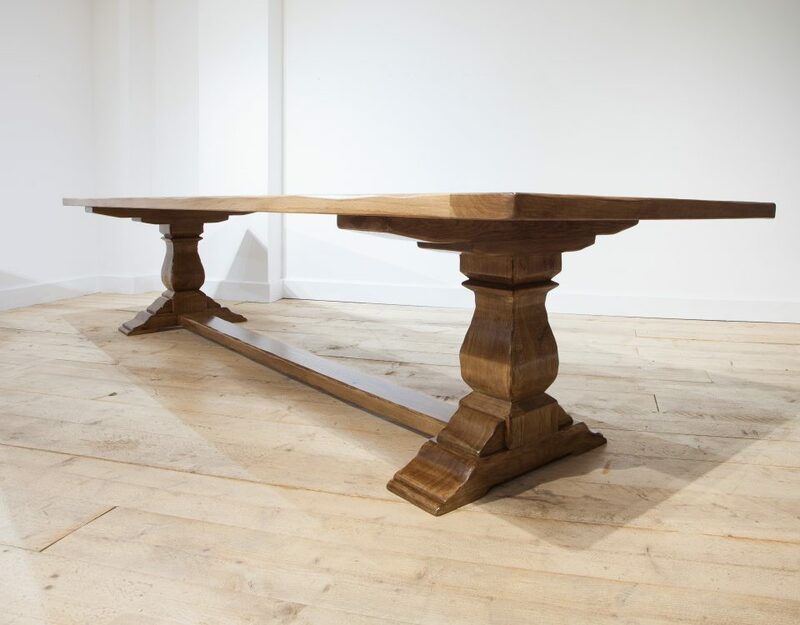 This distinctive handmade trestle table created by Steve in English oak combines a traditional base with a stunning organic table top. The sides retain the live edge of the trunk slab giving the design a fresh, contemporary feel. It is very eye-catching and an inspirational starting point for many other commissioned tables. 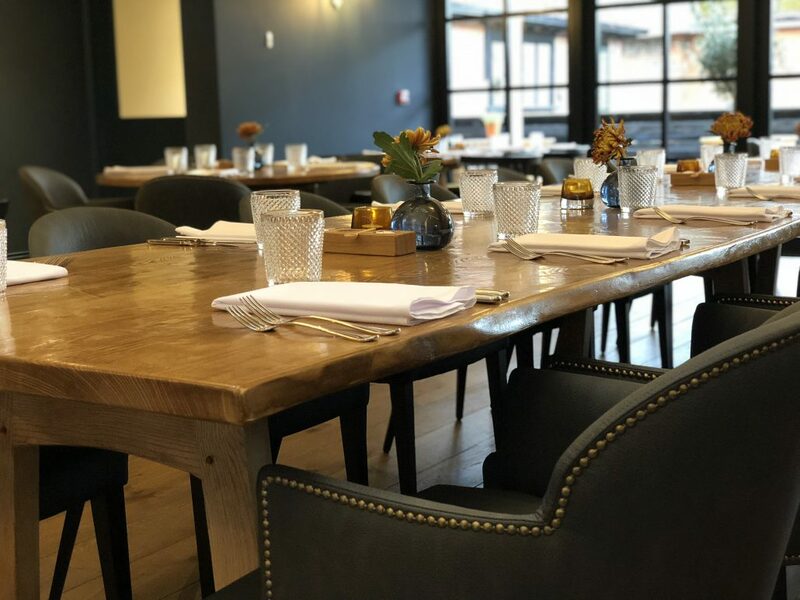 The design of the trestle bench mirrors the table and looks fantastic on its own or paired with the table created to your specifications. A table can be any size or shape. 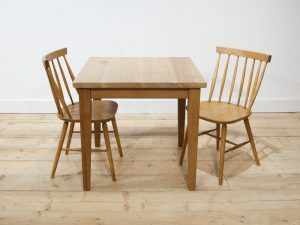 This small square table made by Steve in English oak with slightly tapered legs is just the job for when you need a table for two, or to tuck a table into limited space. 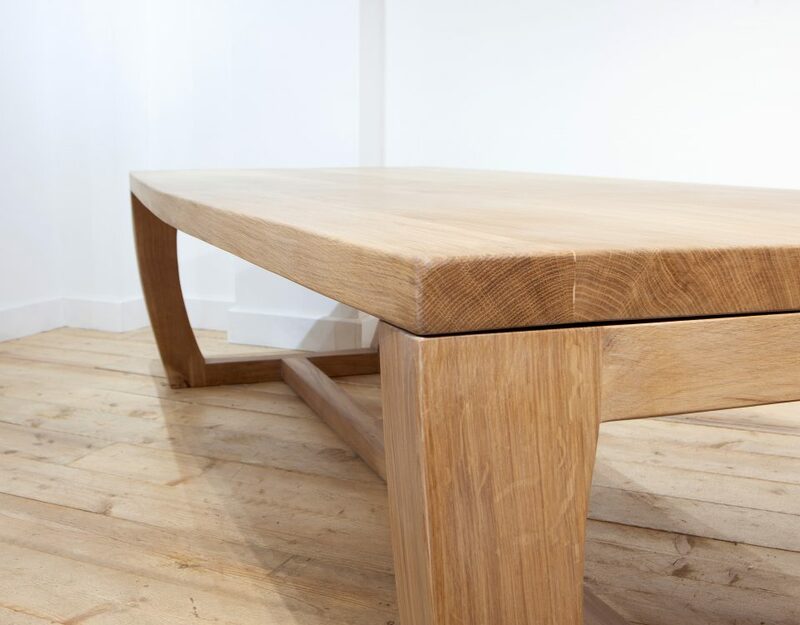 While you can’t get any simpler than a nice honest English oak square table, that’s not to say that there isn’t the opportunity to make it just that little bit special, a unique piece for you and your family. 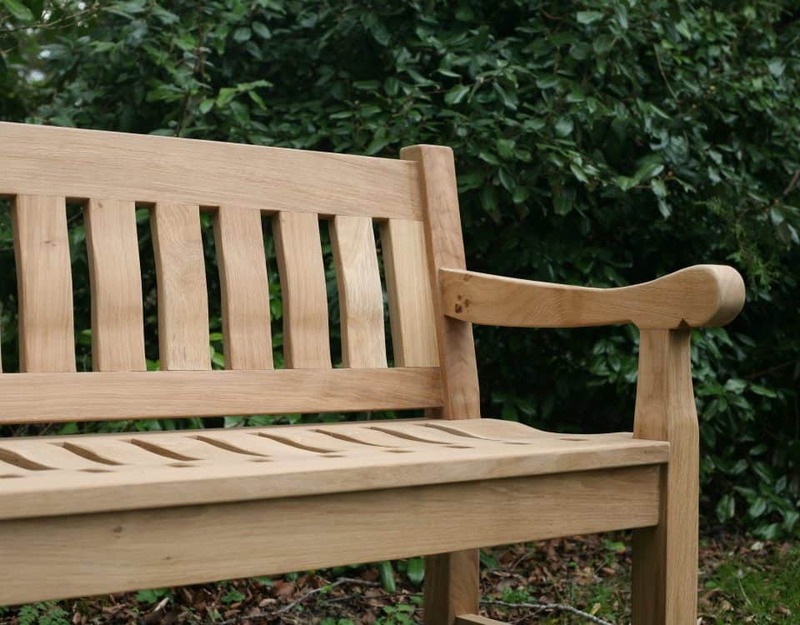 For example, you could choose either a gently distressed or highly polished finish, plain or detailed legs, dovetail joints or rustic wooden peg detailing.